To win big with a Maryland Lottery scratch-off is lucky. Winning big three times in 15 years is remarkable. A 78-year-old Baltimore woman who just claimed her third big prize is thrilled. 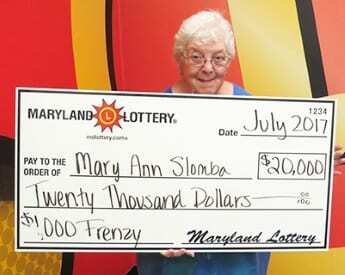 Mary Ann Slomba, a retired marketing researcher, was eager to share her story with Lottery officials when she and her son came to claim her most recent prize this week. Mary Ann’s recent $20,000 win comes from a $1,000 Frenzy scratch-off. She revealed that the $1,000 Frenzy game was not even one of her favorites. She prefers playing bingo and crossword instant tickets. However, she also likes to purchase instant tickets when they are new or when a fresh pack of scratch-offs is opened. For those two reasons, she purchased three $1,000 Frenzy games at the Rosedale Crown and played the $10 scratch-offs while in the Lottery retailer. The cashier, who knows Mary Ann well, confirmed the win. A mother of two adult sons and grandmother of a 2-year-old, Mary Ann had to wait until her son was available to bring her to Lottery headquarters to claim her $20,000 prize. She plans to use some of the winnings to help her family and will save the rest.